When it comes to genres, folk metal is perhaps the most varied of them all. But with the amount of bands that play it these days it is getting harder and harder for folk metal bands to develop a sound that makes them different from the horde of other folk metal acts out there. Germany's Suidakra aren't exactly newcomers to the genre with their ten albums behind them, but compared to similar acts they haven't been very succesful. In 2011 the band released "Book of Dowth", another attempt at reaching the top of the pile of succesful folk metal bands. Let's see what we have here then. Suidakra play heavily folk-influenced melodic death metal, which immediately brings to mind bands like Eluveitie and Ensiferum, both excellent comparisons. The soundscape is dominated by melodic guitar riffs that are often very technical in nature; "Balor" is a great example of this: the drums adapt to the mood of the song as it progresses and changes from slow heavy metal, through semi-groovy, semi-thrashy mid-tempo drumming to double bass and blastbeats where necessary. Occasional gang chants appear in some songs, as well as keyboards and special folky acoustic guitars. A good example is the excellent "Stone of the Seven Suns", which I'm sure is a live favorite because of its sing-along friendly chorus and folky acoustic guitars providing some easily recognisable melodies. The least special thing about the album would have to be the vocals, because while they fit the music, they're just an awfully ordinary semi-scream similar to the vocals of Ensiferum, Eluveitie and countless other acts. But here I'm talking about the regular vocals. Two tracks on the album, "Biróg's Oath" and "Mag Mell", provide a break from the regular melo-death of the rest of the album and also bring some interesting, different vocals to the mix. The first of the two is just a slow melodic death metal song, but it has bagpipes altering the soundscape somewhat together with female clean vocals. While the woman's singing is neither bad nor brilliant, her pronunciation, and the way she puts pressure on her r's in a way that would make any old Texan's ears bleed, annoys the hell out of me. The second of the two, "Mag Mell", saves it all though: it consists of acoustic guitars, some symphonic stuff in the background once in a while, and some excellent male clean vocals. The track sounds a lot like an old folk song, especially in the way the verses are structured. The album can be divided into three chapters: chapter one contains the first three tracks (intro included) which are all very energetic. The drums are fast, the riffs are energetic yet very melodic, and the vocals are semi-screamed. Then comes chapter two which consists of "Biróg's Oath" and "Mag Mell", the slow songs that provide a break from the regular formula reigning over the rest of the album. They serve as a contrast to the energy of chapter one and most of chapter three, and I think that the album would become tedious in the long run had it not been for these two tracks. After those two tracks the pace kicks back in with "The Dark Mound" opening chapter three. The semi-screamed vocals are back with some whoa-oh's in the background from time to time, the energetic yet melodic riffs dominate the soundscape again, and the drums come back with double-bass and occasional blasting. Once the acoustic instrumental piece "Otherworlds Collide" finishes the album, it is clear that Suidakra do indeed have their very own sound, but I can't help feeling like something is missing. While there are no fillers per se there are certain tracks that I feel provide next to nothing to the album, leaving "Book of Dowth" not far from greatness but still out its reach. 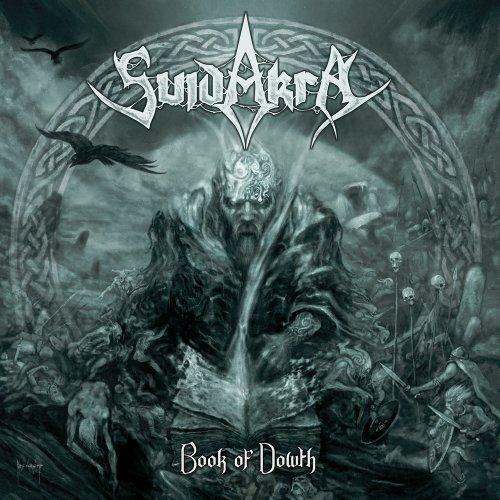 Suidakra is a quality folk metal band, and "Book of Dowth" is definitely worth investing in if you can relate to the bands listed as similar below, but there is still plenty of room for improvement here.